← HIGHLY RECOMMENDED: La Crema 2009 Chardonnay, Sonoma Coast. 13.9% ABV. Around $17 but available for as little as $12.99. HIGHLY RECOMMENDED: elements by Artesa, 2006 Cabernet Sauvignon (85% Cabernet Sauvignon, 7% Merlot, 5% Cabernet Franc, 2% Petite Verdot and 1% Malbec), 62% Napa County, 38% Sonoma County. 14.4% ABV. Around $17 but available for as little as $12.99. We have enjoyed several different incarnations and vintages of “elements by Artesa.” Like the Girard 2008 Petite Sirah we reviewed recently, we’ve enjoyed it with and without friends, with and without food, and with and without other wines to compare it with. 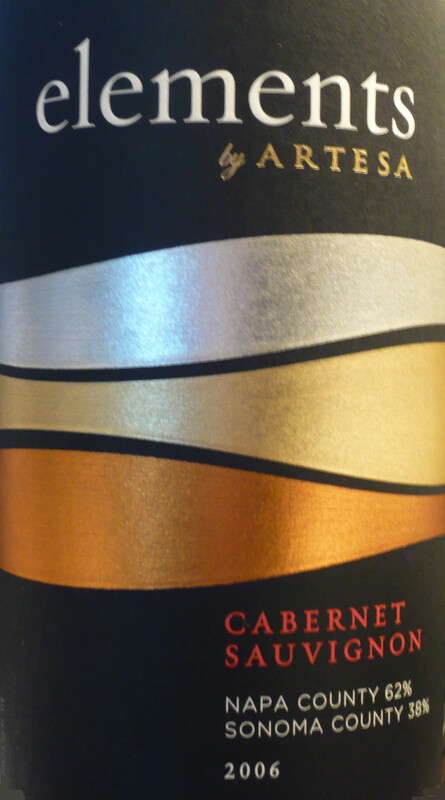 All versions of the “elements” have been excellent, whether labeled simply “red” or Cabernet Sauvignon. Most recently we enjoyed the 2006 Cabernet Sauvignon (actually a Bordeaux-style “weighted blend” red with 86% Cabernet Sauvignon, 7% Merlot, 5% Cabernet Franc, 2% Petit Verdot, and 1% Malbec). It consisted of grapes from 62% Napa County and 38% Sonoma County. APPEARANCE: Presenting with a dark ruby color, and a pink-orange edge, the orange was a clue that this wine is near or at its peak. It was indeed absolutely delicious. NOSE: Blackberry, raspberry, vanilla, caramel, and oak. TASTE: Cola, caramel, lots of oak. Black cherry, prunes. Pie, vanilla. Faint blackberry and raspberry. Complex with layers upon layers. Tannins. Spice and a little bit of pepper. Later: Cedar. Round, good structure. Complex layers. Balanced. CONCLUSION: Three of us tasted this beauty, and we all agreed that it’s another consistent A-list wine. Of the six wines we tasted that night, all of which were excellent, we agreed that this one was the most nuanced—it was a perfect chorus of deliciousness. LABEL NOTES: 62% Napa County, 38% Sonoma County. elements n: parts of a complex whole; the components of an entity that combine to define its essence. The 2006 Cabernet Sauvignon perfectly embodies elements’ synergistic winemaking philosophy, “the whole is greater than the sum of its parts,” marrying 85% Cabernet Sauvignon with 7% Merlot, 5% Cabernet Franc, 2% Petite Verdot and 1% Malbec. This elegant wine, produced from grapes grown in select vineyards in Napa and Sonoma Counties, displays vibrant fruit flavors. Blended for complexity and balance, it has rich, supple texture yet sufficient tannins to provide structure for aging. We invite you to experience elements for yourself. Elements is a portfolio of red wines that combine winemaking passion with the flavors and characteristics of multiple varietals grown in select vineyards across the prime wine regions of Napa Valley and Sonoma County. Shaped first by nature, and then forged by the winemaker’s blending choices, Elements wines are multi-faceted and complex, a testament to what can happen when many become one. VINTAGE: The year began with heavy winter rains, and a late cool and wet spring, lasting until mid-June, caused a slow start to the growing season. To ensure the grapes ripened fully during the shorter than normal season, crops were thinned and leaves removed from around the fruit zone to increase exposure to the sun. Leaf removal also increased air circulation around the clusters, keeping the fruit healthy and free of rot, even after an early October rain. An additional week of ripening intensified fruit flavors. VINEYARDS: Grapes were harvested from 15 cooler sites within Napa and Sonoma counties. Mild temperatures created conditions for slow, even growth, which produced fuller flavors and better tannin structure. Leaf removal on the sides of the vines receiving morning sun allowed the fruit to ripen fully. Careful irrigation management fostered a healthy canopy that protected the fruit during summer heat spells. Grapes were handpicked at peak ripeness. WINEMAKING: The berries were gently de-stemmed and just barely split open. Fermentation occurred in temperature controlled stainless steel tanks. Full extraction of berry flavors was accomplished through a combination of punching down the cap, gentle pumpover irrigation and delestage. For approximately 15 days post primary fermentation, the wine soaked on skins to produce a fuller mouthfeel and elegant structure. The wine was then pressed directly to barrel and underwent malolactic fermentation. It aged in French oak for 24 months and was racked several times to incorporate air into the evolving wine. This Cabernet Sauvignon is a true Bordeaux style blend. Merlot tames the wine and softens the tannins, while Malbec enhances structure. Cabernet Franc and Petit Verdot increase aromatic complexity and depth of flavor. TASTING NOTES: Deep garnet in color, its seductive aromas of cassis and red currant mingle with a delicate fragrance of thyme, milk chocolate, and caramel. Its concentrated red berry flavor develops on the palate and lingers with natural acidity. Supple mature tannins provide velvety texture and structure. This well balanced Cabernet Sauvignon will continue to develop for several years, yet is ready to enjoy now. HIGHLY RECOMMENDED: elements by Artesa, 2006 Red Wine (23% Cabernet Sauvignon, 22% Tempranillo, 20% Merlot, 18% Malbec, 11% Garnacha, 2% Petite Sirah, 2% Petit Verdot, 1% Graciano, and 1% Cabernet Franc), 65% Sonoma County, 35% Napa County. 14.3% ABV. Around $17 but available for as little as $12.99. There’s nothing to say but “hugely delicious.” 4,400 cases produced—becoming more difficult to find. Aged 18 months in 100% French oak, 25% new. VINEYARDS: Grapes were harvested from 12 vineyard sites within Napa and Sonoma counties. The foundation of this wine is Cabernet Sauvignon from our Alexander Valley mountainside vineyard and Tempranillo from our Carneros Estate. The Alexander Valley vineyard is situated in a warm microclimate that produces aromatic berry fruit and supple body. In contrast, Carneros lies north of the San Francisco Bay and is buffeted by brisk winds and often is shrouded in fog. Tempranillo grown here is spicy, brooding and dense. WINEMAKING: Following hand-harvesting, the grapes were de-stemmed and gently split open. Full extraction of berry flavors was accomplished through a combination of punching down the cap and gentle pumpover irrigation. Post-fermentation extended maceration was used to enhance body and structure. The wine was then pressed directly to barrel and underwent malolactic fermentation. It aged in French oak for 24 months and was racked four times during 18 months of aging to mature the wine. TASTING NOTES: This finely crafted blend of varietals of three famous wine regions—Bordeaux, Rhone and Rioja—is brimming with lively dark cherry, ripe plum, cassis and juicy blueberries wrapped in a spicy bouquet of cinnamon, white pepper, clove and faint hints of black truffles. The flavor is true to the aromas and the texture is silky and supple. The wine is ready to enjoy now, yet has the structure to age gracefully for several years. This entry was posted in Cabernet Franc, Cabernet Sauvignon, California, Graciano, Grenache/Garnacha, Malbec, Merlot, Petit Verdot, Petite Sirah, Red Blend, Tempranillo. Bookmark the permalink. One Response to HIGHLY RECOMMENDED: elements by Artesa, 2006 Cabernet Sauvignon, AND elements 2006 Red Wine.